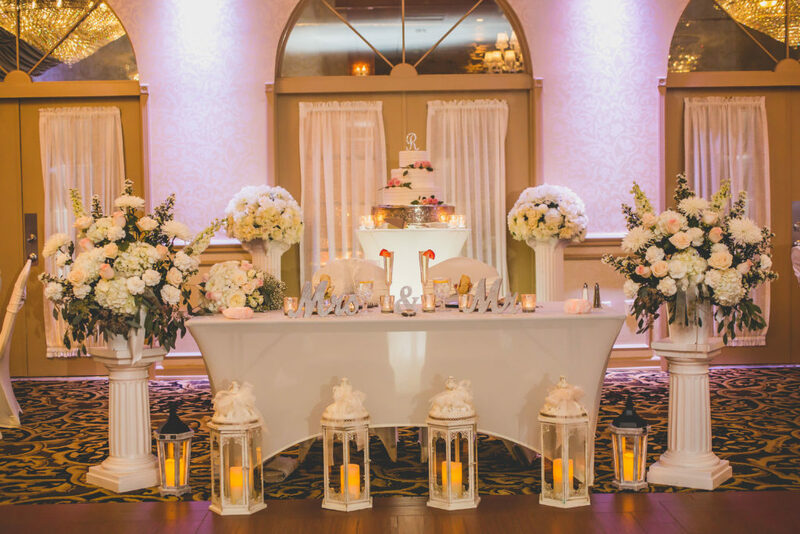 Of all the tables and chairs that will fill the reception hall on your wedding day, the bride and groom table has to be one of the most important. Here is where husband and wife sit as they enjoy their meals, drinks, and socialize with loved ones. It’s where the stars of the show sit. 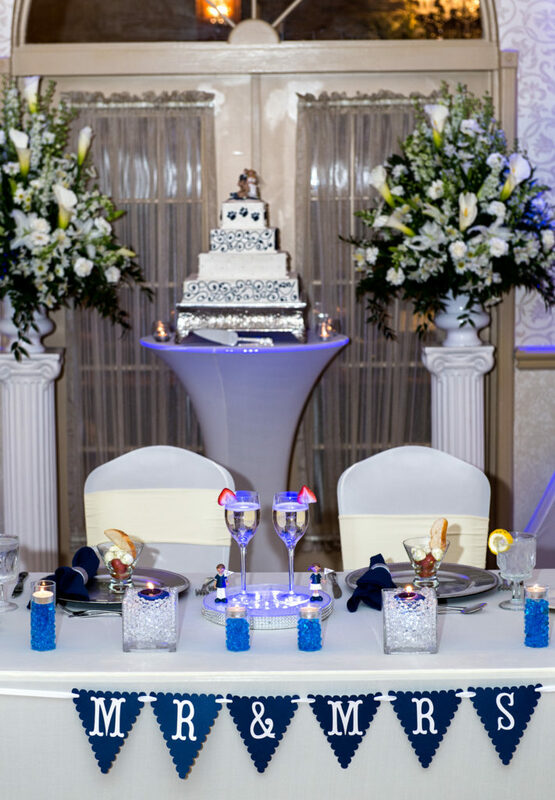 Which is why many couples go the extra mile to make their sweetheart table extra special. 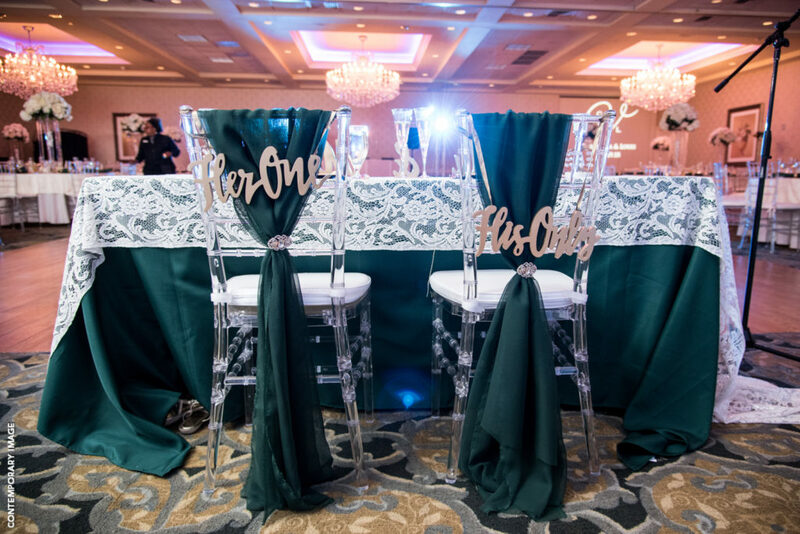 You want your guests to know right away where they are to sit as opposed to where the bride and groom sit. 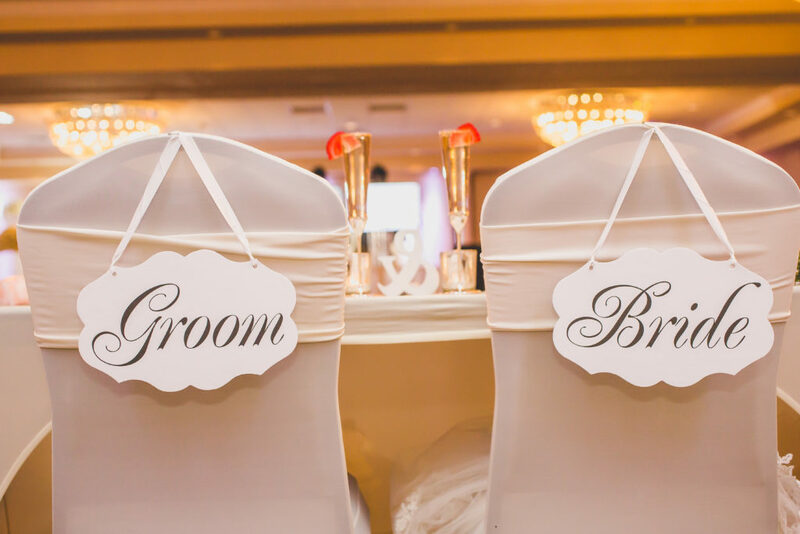 Adding signage to your table and chairs, instead of basic name tags is a creative idea. 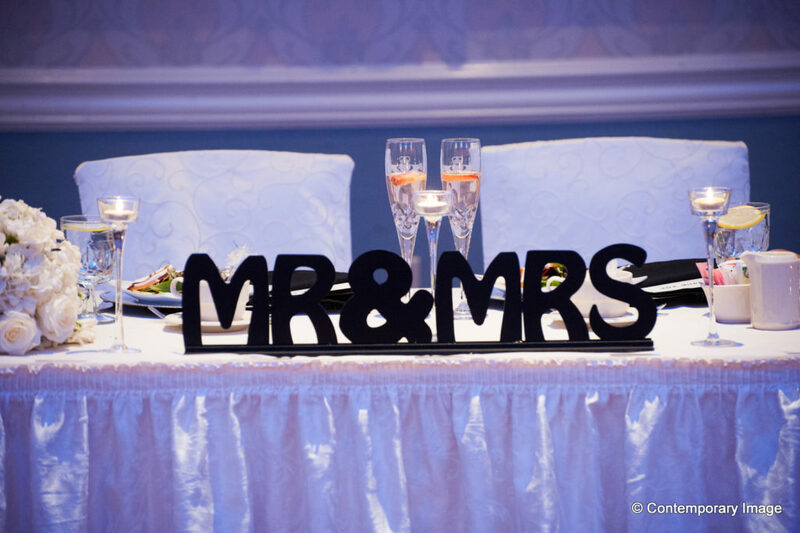 Mr. and Mrs. signs can easily be created for the bride and groom sweetheart table using a number of features from different fonts to lights. There are also cute signs to add to the back of the chair from His and Hers to Soulmates and more. 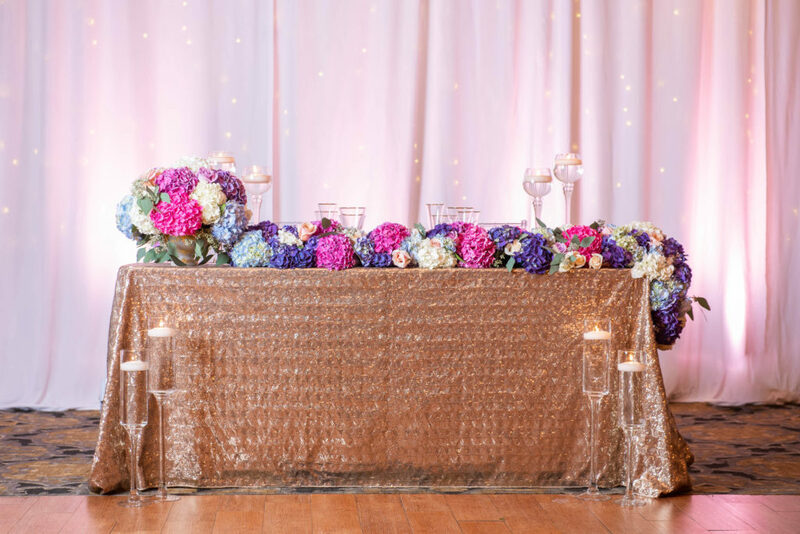 If you want your sweetheart table to stand out from your guests’ tables, then adding a bit of sparkle to your table would suffice. 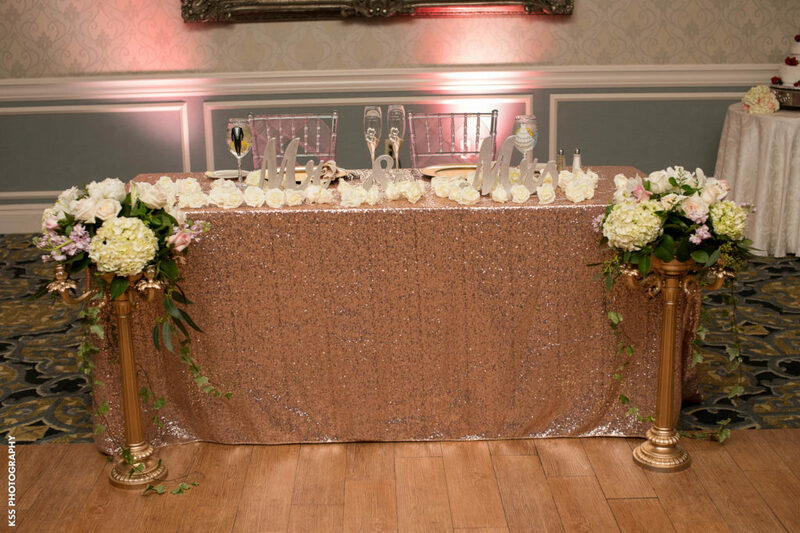 The Crystal & Emerald Ballrooms offer these glittery and bedazzled tablecloths, and they make a beautiful addition to the table. They reflect the light from the room well and pair amazingly with the rest of the decor. 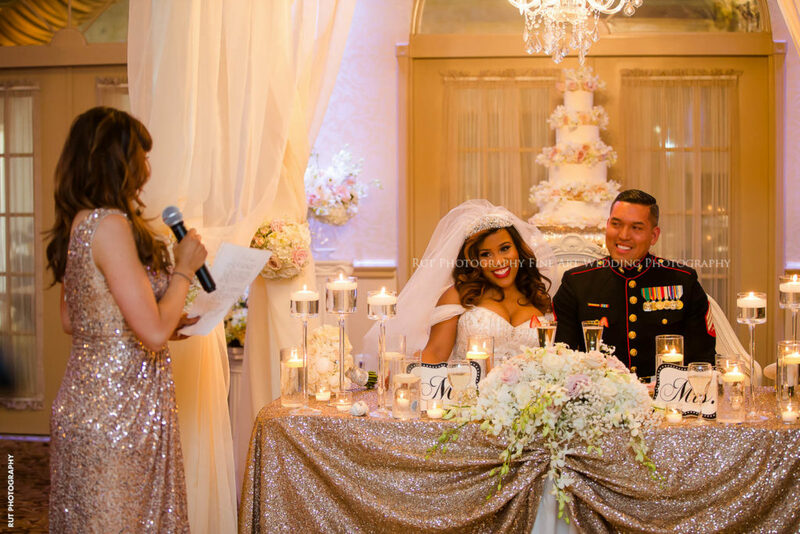 More than just wanting to have a flower centerpiece for their sweetheart table, these couples took it a step further. Incorporating large quantities of flowers on and around the table give it a romantic flare that the rest of the tables don’t have. 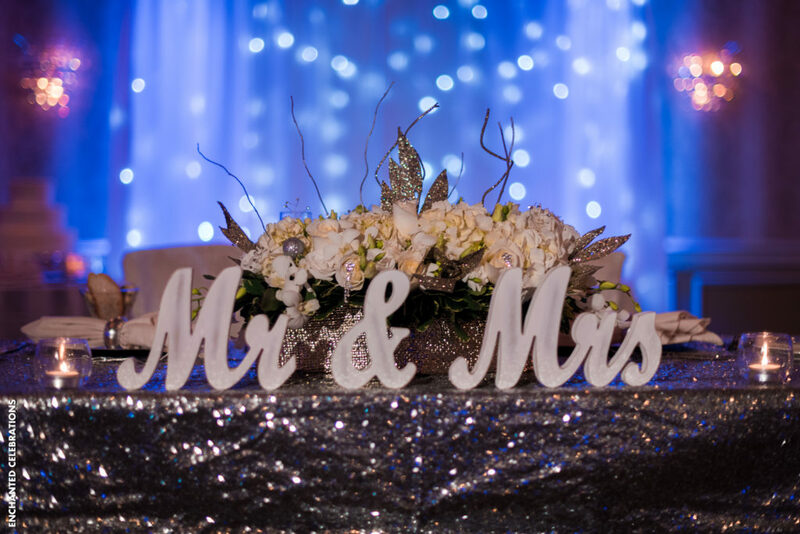 Some couples prefer to stick with the theme of their wedding when it comes to reception decor. 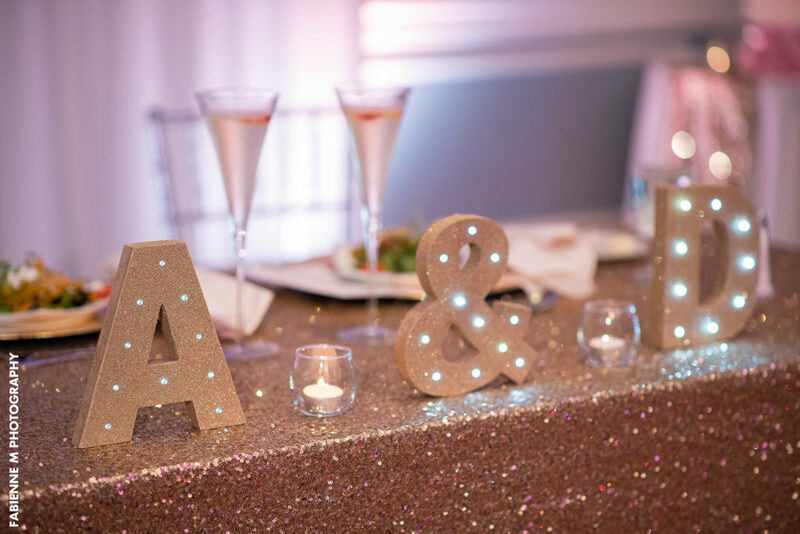 If that’s the case, you can still make your bride and groom table unique. 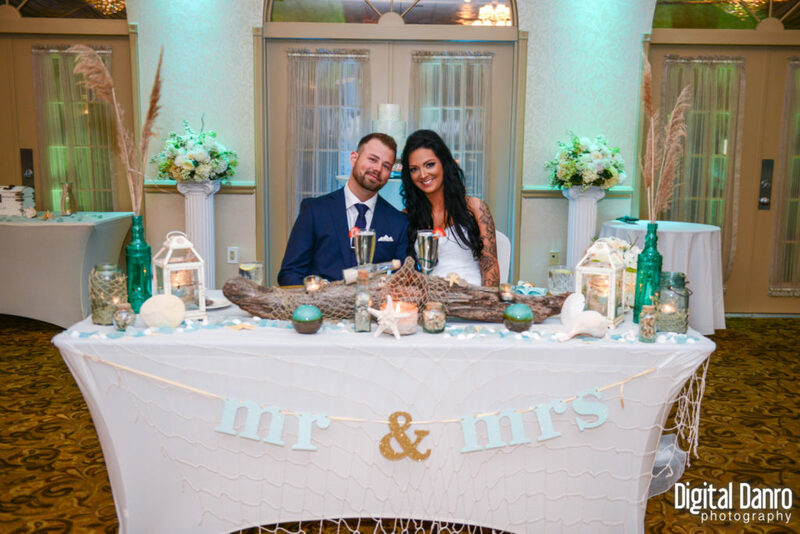 Above, you’ll see one couple had a beach themed wedding and designed their area beautifully with seashells, candles, and a lovely wooden centerpiece. 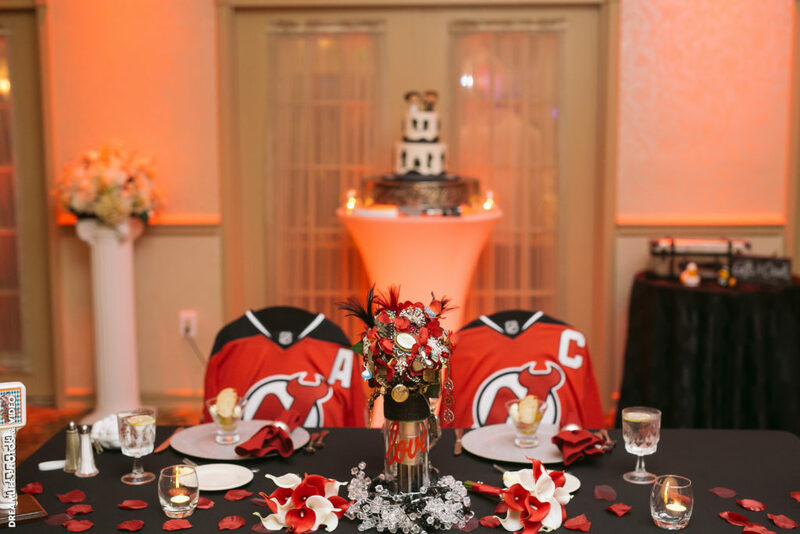 The other couple had a sports theme in mind and even draped their chairs in their team’s jersey. 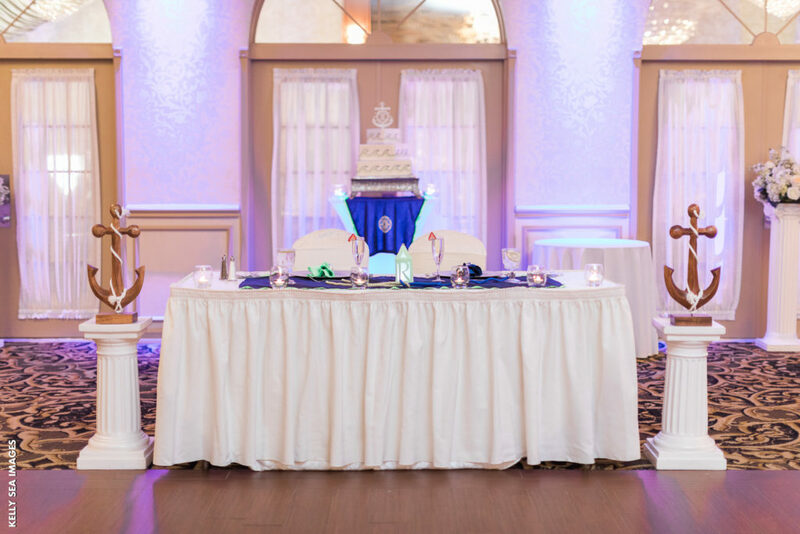 When you enter the reception hall on your wedding day, the first thing you want to see is where the bride and groom will be sitting. So why not add a little extra style and flare to your table? Hopefully, you were able to gain some style inspiration from the table designs shown here.